Our goal at Bergen Premiere Dentistry is to always help save as many of your natural teeth as possible. However, there are instances when tooth extraction is necessary to save the rest of your teeth. Our highly experienced and gentle dentists perform simple and surgical tooth extractions for the removal of third molars (wisdom teeth), decayed teeth and impacted teeth to help protect and improve the health of your smile. Teeth extractions are mostly performed because of pain, swelling, infection or decay. It is also done as a preventative measure to avoid more serious dental health problems in the future. If impacted or Impacted or decayed tooth can cause a number of health conditions if left untreated. Tooth extraction is necessary when our very best efforts are not enough to save or restore a tooth. Teeth that are deeply decayed are deemed non-restorable when they don’t respond to root canal therapy. There are other conditions when tooth extraction is recommended, such as broken tooth with extensive bone loss, a tooth with ruptured root or a badly-decayed tooth. Third molars, more popularly known as wisdom teeth, are the last four of 32 teeth to erupt around the age of 17. They are located at the very back of the mouth (upper and lower), near the throat. The term “wisdom” comes from the idea that the molars erupt at an age when a person is maturing into adulthood. Wisdom teeth can become liabilities and slated for extraction because they are highly likely to become impacted or poorly positioned or decayed because they are difficult to clean, which can cause dental problems. Our dentists may recommend tooth extraction for extensively decayed tooth when repair or restoration procedures, such as root canal therapy, are no longer suitable because the health of surrounding bones and tissues are compromised. If the decay extends to the pulp, which is the center of the tooth that contains nerves and blood vessels, the bacteria can spread and leading to infection. Our dentists have completed special training to perform simple or surgical tooth extraction. Before removing your tooth, you will be given local anesthetic injection to numb the area where the tooth will be extracted and prevent pain throughout the procedure. For impacted tooth, the dentist will make an incision on the gum to surgically expose the impacted tooth and gently rock it back and forth using forceps to loosen the tooth before pulling it. 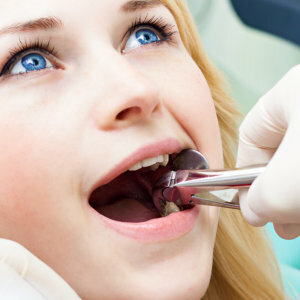 After extraction, the dentist may place a few self-dissolving stitches to close the extraction site or place a gauze pad into the socket and have you bite down on it to stop the bleeding. With highly-experienced and caring dental team, convenient office hours and flexible appointment scheduling, Bergen Premiere Dentistry is the dental practice to turn to if you’re looking for dependable dental care in Ramsey, NJ. Call (201) 746-4614 today for more information or to schedule Teeth Extractions appointment. Are you looking for a great dentist in Ramsey, NJ?